WorldGolf.com Magazine - Is Michelle Wie golf's Terrell Owens? If NFL bad boy Terrell Owens acted like Michelle Wie did at the Fields Open, he'd be getting ripped from San Francisco to Philadelphia. All over again. But because it's the lovable Wie, it's not even discussed. When skier Bode Miller scoffs at the importance of victory, he becomes a national punchline. When Michelle Wie does it - well, she's just a fun-spirited teenager! Confused as Pete Rose in a self-dignity seminar or Dennis Rodman in a convent? You should be if you only relied on the mainstream media (there's a phrase you can't say without feeling like a Republican!) for your Fields Open coverage. The men and women of the Wie-adoring press completely overlooked one of the most extreme plays of crass commercialism in sports history. There Wie was shamelessly pimping for her new Omega watch sponsor in her post-tourney press conference when she was supposed to be talking about doing just enough not to win again. Heck, she could have declared that that final-round 66 should vault her to the No. 1 spot in the most ridiculous rankings in sports. Anything but what she actually did - which is show off her new watch. The diamond-encrusted one an Omega flack just happened to give her before the final round. "It's sparkly," Wie said. "I kept checking the time like every five minutes." Imagine Terrell Owens waxing poetic about his new diamond earrings from Tiffany & Co. at the podium after a game. And, oh yeah, those Tiffany's dudes just signed me to a fat endorsement contract! TO would be crucified. Mel Gibson might even be called in to provide the special effects. Michelle Wie merrily smiles away, with another check in her back pocket. Sure, the Winless Wonder is now 0 for 32 in pro tournaments. But who cares when you can pull off stunts like this? It all shouldn't really come as a surprise. Michelle Wie's been reared and carefully molded for the express purpose of making as much money as possible, right down to ducking competitors in her "amateur" career. Even I didn't know Michelle Wie was this good though. Omega must be so proud. Give me Bode Miller any day. As always, WorldGolf.com welcomes your comments. 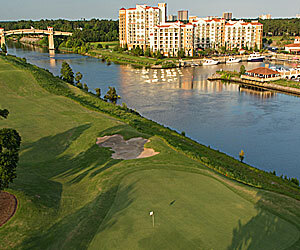 Enjoy 3 rounds of golf at Byrd, Maples and Jones starting at $194.00. Las Vegas golf does not carry the long tradition of some golf destinations. It's not going to have a run of courses on the fuddy-duddy architectural critics' lists. But it's some of the most entertaining golf around. In Vegas golf, just like on Las Vegas Boulevard, it's all about the show. Forget looking for subtleties. Our list of the top 10 Vegas tracks includes the showstoppers of showstoppers, including no. 1 Wolf Creek Golf Club in Mesquite and runner-up Shadow Creek. Most golfers will tell you they play much better when they feel confident. Unfortunately, few golfers understand how to get that feeling of confidence in the first place. Here sports psychologist Dr. Alan Edmunds explains that golfers would be better off with a "deep confidence" - a reliable mind-set that will enable you to shake off a bad shot and come back with your A game. 2 rounds of golf & stay 2 nights at courses like PGA West or La Quinta Courses & lots more of your choice from different given options starting from $528. Players have hitting golf balls further and further for years now, with golfing purists nervously keeping their eye on the situation. Now, when a guy like Bubba Watson is hitting 400-yard drives, something needs to be done, according to Seve Ballesteros. But if changes will be made in golf, they need to be drastic. Using a golf club with a head on it like a marshmallow? That's just one of the changes golf needs. Stay at the luxurious Marina Inn at Grande Dunes Resort Club and get the best pricing no matter how many rounds you play.